The rarely blooming titan arum is on display at the Chicago Botanic Garden. 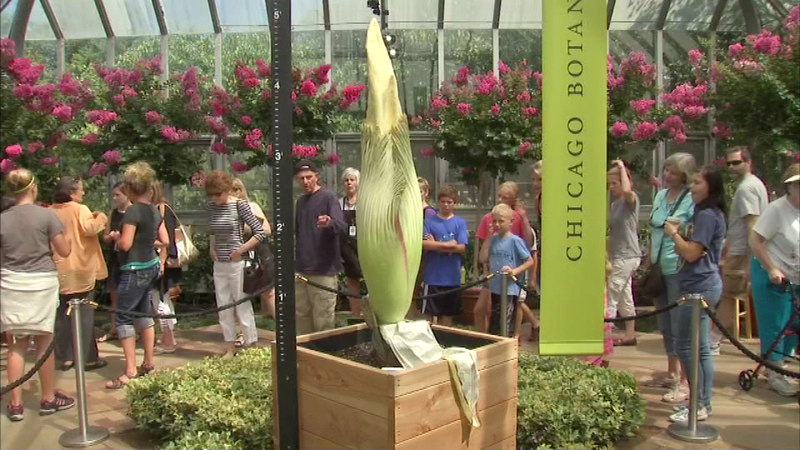 GLENCOE, Ill. (WLS) -- The so-called "corpse flower" at the Chicago Botanic Garden has yet to bloom. The 66-inch plant, named Spike, has been closely watched since last week. So far, more than 36,000 people have come to see it. A spokesperson for the Chicago Botanic Garden said Monday that the growth of the plant has slowed, which could indicate it is ready to bloom any day now. Visitors will have only a few hours to experience the flower and its stench, which has been likened to a mixture of limburger cheese, garlic, rotting fish and smelly feet. The odor is strongest in the early morning. Once it blooms, the garden will stay open until 2 a.m. on bloom day only. To view the flower's live webcam, click here.